For starters, a mid-cycle upgrade for the 2016 Mercedes Benz CLA sounds unjustified because the wagon got released just a year ago. It is not clear whether there will be buyers interested in upgrading their vehicle so early after an initial purchase. 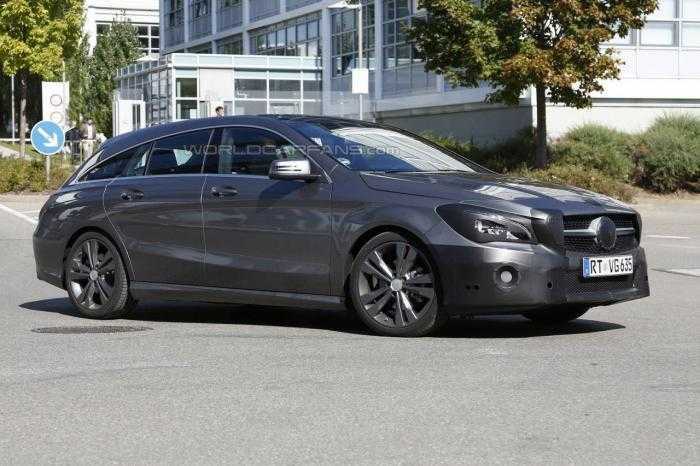 Mercedes Benz CLA Shooting Brake is coming whether you embrace it or not. The car was revealed in a set of spy shots and surprisingly, it was not camouflaged. The manufacturers might have let it out in the open because it looks very much like the CLA with very minor changes in terms of looks and features. The vehicle has received mechanical upgrades which include Dynamic Select driving modes apart from the adaptive damping suspension. The latter feature will be available on all entry level models, while it will give an amazing level of boost for the Mercedes Benz AMG variants. Apart from the mechanical changes, the Mercedes Benz CLA Shooting Brake will sport stylish and sportier front lights as well as brand new bumpers. The interior features are similar except for more compatibility with mobile devices and better connectivity. In every perspective, it is evident that the wagon is not going to differ much from the model which got launched a year ago. For buyers who may not mind about making a new investment or for those looking forward to changing their existing wagon, this might be an able choice. The CLA Shooting Brake is expected to be powered by a four-cylinder 2.0 liter engine and will rely on a 7-speed dual clutch transmission system. The basic model will use a front wheel drive system, but if you are adamant on having stubborn acceleration, the manufacturer offers an option to upgrade your wagon to an all-wheel drive. If you live in the United States, you should probably skip the idea of buying the 2016 Mercedes Benz CLA Shooting Brake when it gets officially launched. The manufacturer opined that the demand for wagons is very less in the country when compared to the other regions. From their perspective, it is more than reason enough to skip launching the wagon in there. Mercedes Benz has plans to come up with more new cars and have plenty of concept cars lined up for showcase. They are expected to reveal them during the first auto expo which takes place during the first quarter of 2016. Until then, the brand will focus on revamping the existing models and replenishing supplies to their authorized dealers.